Grove Harvesting travels from southern Oklahoma to northern North Dakota harvesting and following the wheat belt. Then returns in the fall to harvest corn, soybeans, and milo around the southern Nebraska and northern Kansas area. Larry and Nancy Schroeder owners of Schroeder Harvesting, Inc located in Inman, Kansas have actively been enjoying harvesting crops for their customers since 1989. They cut small and large grain crops. Schemper Harvesting is a family-owned and operated custom harvesting business whose main purpose is to provide a professional harvesting service to farmers throughout the Midwest and the Great Plains. 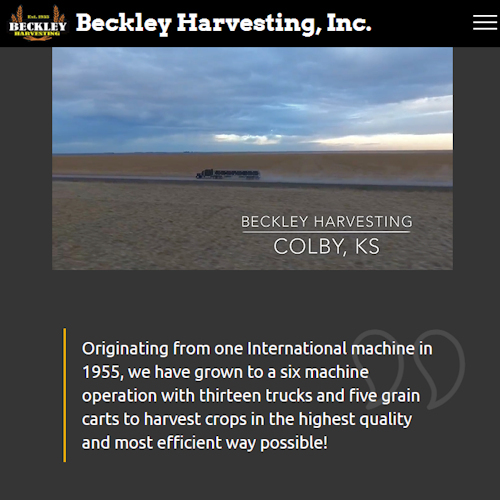 We harvest wheat and other small grains, corn and soybeans throughout the USA with John Deere combines and a complete line of up-to-date supporting equipment. We operate two Gleaner combines equipped with MacDon flex Drapers and corn heads. Peterbilt semis, and all supporting equipment. We harvest wheat, canola, peas, corn, soybeans, and milo from Texas to the Canadian border. Please contact us for any of your harvesting needs!